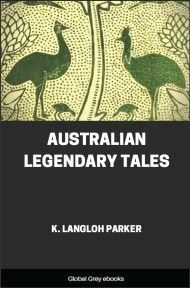 This is a collection of 19 folk-tales and myths of the Australian Aborigines. The stories recount tales about nature and animals and include, A Legend Of The Great Flood, How The Sun Was Made, Why The Fish-Hawk Was Driven To The Sea, How The Native Bear Lost His Tail, Why The Crow Is Black, The Story Of The Seven Sisters And The Faithful Lovers, and, How The Kangaroo Got A Long Tail, And The Wombat A Flat Forehead. 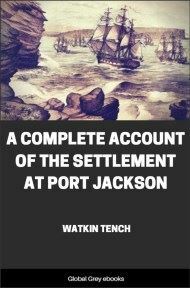 When the white man first carried the burden and blessing of civilization to the shores of Australia, he found the land inhabited by a very primitive race of people. They lived simple lives, and their activities were confined to hunting, fishing and the procuring of vegetable food. Their dwelling place or gunyah was a rude shelter formed by the boughs and bark of trees, which afforded them little protection from the elements. The weapons of war and the chase used by the men were the boomerang, spear and club. They also used a stone axe, which consisted of a piece of hard brittle stone chipped or ground to a suitable shape and fixed securely in a forked piece of wood by means of bark, string and gum, or animal tendons. The women used a stick hardened by fire and pointed at one end. It was called a "digging stick," and was used both as a weapon and a domestic implement for digging edible roots. Fish were either speared or caught in nets woven of grass and bark. The nets were set in shallow portions of the river course, and the fish were usually trapped as they travelled with the tides. Extraordinary skill was developed by the natives in the use of the fish spear. The native fisherman would wade in the river and secure his meal by throwing the spear at a ripple in the water which experience had taught him was an indication of the presence of fish. The kangaroo and other animals were stalked by the blackfellow and killed for food, and the skins and furs were used for sleeping rugs. Certain species of grubs and snakes were included in the somewhat extensive menu of the natives, and, when a lizard was seen basking in the sun, it was promptly caught, cooked and eaten. As the natives had but little knowledge of the methods for preserving animal food, their existence alternated between a feast and a famine. When a big haul of fish was secured, it was customary for them to camp on the riverside until the food supply was exhausted. The natives lived together in tribes. Each tribe was distinguished by a common language, peculiar tribal customs, burial ceremonies, initiation rites ("man-making"), and magical beliefs. The ceremonies connected with the "making of men" were very elaborate and surrounded with religious secrecy. The secrets of initiation were held exclusively by the men of the tribe, and, if a woman was caught within sight of the ceremonies, she was immediately killed. Attached to each tribe were primitive doctors or "medicine men." These men were supposed to possess methods of magic whereby they could cure disease, heal wounds, bring secret death to members of hostile tribes, make rain in time of drought, and perform other miracles. The natives believed in the power of these men to a degree that is almost incredible to us. 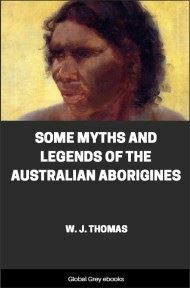 To-day, the living descendants of this primitive native race are the tribes of blackfellows who roam across the northern and central portions of Australia. They live in the same wild state as their forefathers did many centuries before the boom of the white man's gun broke the stillness of their hunting grounds. At one time scientists were agreed in placing the Australian aborigines among the lowest surviving representatives of the human family. They regarded them as the bottom rung in the ladder of civilization. More recent investigators, however, concur in the opinion that this view is not quite correct; for, though our aborigines are inferior to the ancient Incas of Peru and to most branches of the Polynesian race, they have a remarkable knowledge of Nature, a complex social system, and, where unpolluted by contact with degraded white men, a high moral sense. The mind of a savage, like that of a child, is filled with a questioning fear of those things which it does not understand. The wonders of Nature, explained so clearly to us by modern science, remain for him a hidden mystery. The impression which he receives from his immediate surroundings is reasoned in the terms of his limited experience and imagination. In this manner, many beautiful myths and legends have been invented by primitive people to explain to their own mental satisfaction the wonderful and terrible natural system of which they are an inseparable part. The blackfellow, wandering through the dark virgin forest and over the wooded hills, wondered at the mysteries of nature which surrounded him. He saw the warm sun rise from behind the mountains in the east, travel across the blue vault of the sky, and again sink beneath the earth far to the west. When the shadow of night was across the land, he slept beneath a canopy of clouds whose dimness was lit by the light of the moon and studded with golden stars. In fern-grown gullies, he heard the music of running water as the tiny creek rippled over its stony bed. From the hills, he saw the silver river winding its way through rocky mountain gorges to the distant sea. The flood waters, sweeping down from the snow-capped mountains, were a living thing of terror. With a deep, sullen roar, they carried all before them, and Death followed swiftly on their turbulent tides. Far in the distance the sea glinted like fire in the noon-day sun. Men told strange tales of the sea and the dark, frowning cliffs that guarded the land, while the green surf, carrying with it strange treasures of the deep, thundered on the golden beaches.